Product prices and availability are accurate as of 2019-04-25 12:38:44 UTC and are subject to change. Any price and availability information displayed on http://www.amazon.com/ at the time of purchase will apply to the purchase of this product. Fight against a sedentary lifestyle with the easily transportable and fully assembled SF-E3872 Magnetic Under Desk Elliptical by Sunny Health & Fitness. This space saving exercise machine can help get your legs moving in a forward motion. Large textured foot pedals prevent slippage while in use. This elliptical is excellent for increasing blood circulation, joint range of motion, and improved lower body muscular endurance. Use the tension knob to select 8 levels of belt drive magnetic resistance paired with low maintenance design to provide a wide variety of exercise intensities to fit your specific needs. Use the central digital monitor to track speed, time, calories, and distance, or choose the scan function to cycle through all workout variables. The 7-inch stride length moves smoothly with integrated wheels along the stable frame. 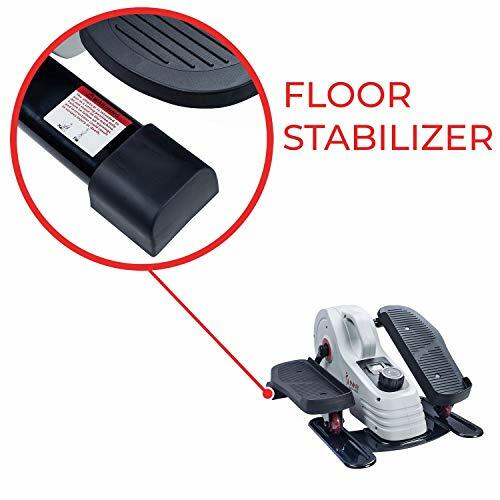 Use the floor stabilizers for an even placement on floor surfaces. 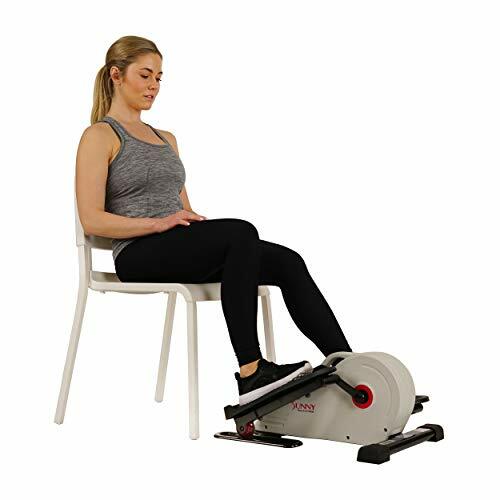 Measuring at 24L x 19W x 11H inches this low profile and compact exercise machines can be placed anywhere you choose to sit. Weighing only 24. 2 pounds and equipped with a conveniently centered transportation handlebar, you can easily pick up and move this elliptical with ease. This under desk elliptical arrives fully assembled! 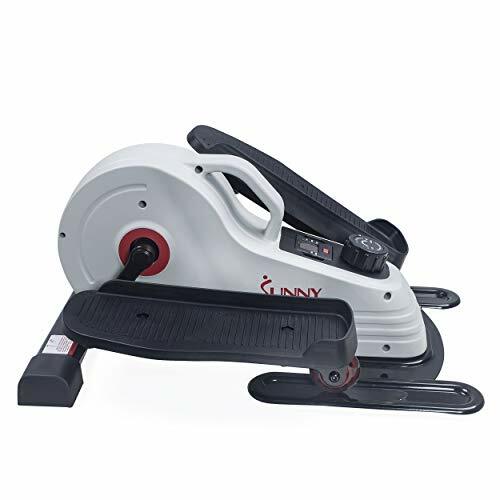 Convenient pre-assembly means you can save time, money and energy on putting together your elliptical, simply unbox and begin your fitness journey! DIGITAL MONITOR: Track time, speed, calories, and distance using the centrally located digital monitor. Or chose the scan function to scroll through all carriable while your workout. 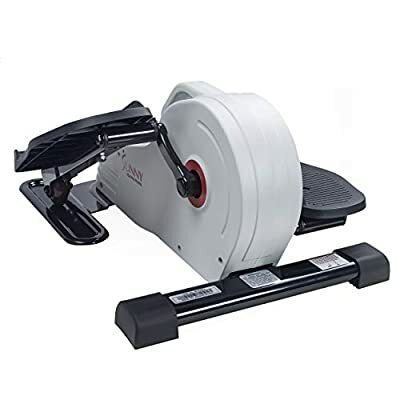 BELT DRIVE MAGNETIC RESISTANCE: This elliptical pairs a belt drive mechanism with magnetic resistance to give you a low maintenance and smooth quiet exercise experience. 8 LEVELS OF RESISTANCE: Chose between 8 levels of magnetic resistance using the tension knob to provide increased levels of intensity to your workout as you build muscular endurance. 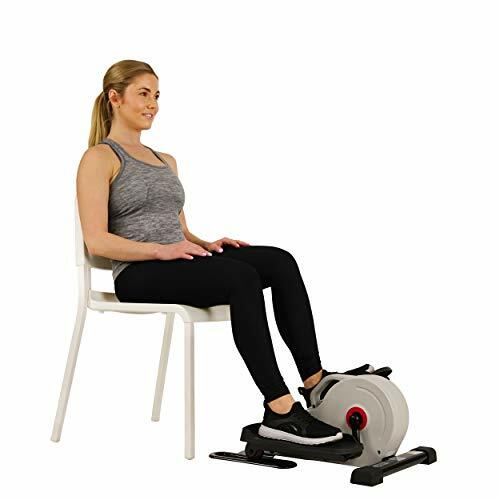 COMPACT SIZE: This low profile elliptical will fit under most desks and around your favorite chairs giving you the freedom to exercise while you sit in many different environments. EASY TRANSPORTATION - A centrally located transportation handle allows you to move your elliptical with ease.